The latest alert happened yesterday, at a house in Tallaght. 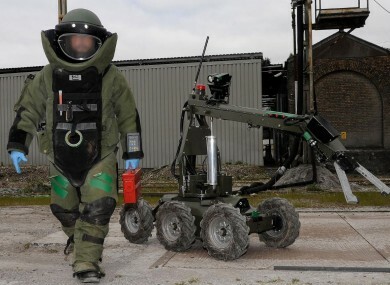 DEFENCE FORCES BOMB disposal teams have responded to 250 call-outs so far this year. Of that number, 81 were described as ‘viable devices’. The latest alert happened just yesterday, as an improvised device was made safe at the porch of a house in the Bawnlee area of Tallaght, south Dublin. The bomb was removed to a green area nearby, where a controlled explosion was carried out. While there has been an increase in alerts, the number of viable devices has dropped since last year, when over 90 such bombs were found. The Defence Forces define a viable device as having “all the component parts to initiate and cause serious injury or loss of life”. The explosive devices are often used as a means of intimidation by organised crime gangs. There has been in increase in the number of viable bombs uncovered in the last two years. The comparable number for 2011 was just 55. Email “250 call-outs for the bomb squad this year, slight reduction in viable devices”. Feedback on “250 call-outs for the bomb squad this year, slight reduction in viable devices”.